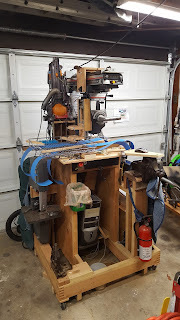 Chip's Wood Shop: Woodworking is fun! Emergency rooms are not! Woodworking is fun! Emergency rooms are not! I'm very thankful to live in the US where warning labels are everywhere. I just bought a flashlight with a warning label stuck on the side. Everyone here knows about the legal consequences pillows threaten for removing the warning labels. In the sea of caution signs, it may become easy to ignore safety warnings, but if you can't pay attention to safety, don't even think about woodworking. I'm proud that I'm using ten good reasons for wordworking safety to type this heartfelt message. Seriously. People get hurt all the time and the damage is often permanent. I know a lot of people that can show you. I love woodworking, but I'm not willing to hurt myself for it. I know my family wants me to stay safe, too. You really shouldn't even be around power tools without safety glasses, but the old saying is absolutely true- the most critical piece of safety equipment is between your ears. There is no guard or personal protective equipment that can save you from careless behavior. So think before you act. Generally speaking, think about where things want to go if you lose control of them. Make sure that the result doesn't injure or kill you or someone else. For an easy example, you can get seriously hurt with a screwdriver. How many times do you hold something in one hand while working on it with a screwdriver in the other. Depending how you are pushing, it can slip, and before you know it, the end is in your other hand. It happens all the time. When possible, think about securing your work so it can't move. Power tools will happily throw, spin, or shatter the piece you are working on. Sometimes holding the work with your hands can be done safely, but if you have it clamped in place, you can use your hands for control of the moving parts, instead. Table saws account for most of the amputations people I know have had. 100% of them were avoidable. 0% of them were intended. Push sticks are essential. They are way cheaper than hands. Even with a push stick and a guard, make sure that if something suddenly moves or slips, your hand is not headed for the blade. Even more common are injuries from the work getting thrown by the blade. Make sure that, if the blade catches your work and shoots it back, it isn't going to hit you or anyone else. Feather boards and some guards are designed to prevent kick-back, but you still don't want your anatomy in the line of fire. I really cannot list all the careless behaviors that lead to injury, because the possibilities are endless, but here are a few pointers. Make sure chuck keys go back to their home (not in the drill chuck) before they leave your hand. Drills will happily throw them at you if you forget. Anticipate the consequences of a circular blade catching and kicking back. Make sure you are not in the way if it does. Cutting, sanding and grinding generates dust and particles. Whatever your system is for dust collection, make sure it does not include your eyes and lungs. Remember that dust on your forehead can fall into your eyes, so even if you were smart enough to wear goggles, think about this when they come off later. Avoid holding your work piece in your hands. A solidly-mounted vice frees up one hand to help the other and is a much better place for sharp or heavy tools to accidentally land. Unless your goal is making blades, remember that freshly cut things often have sharp edges and a good next step is to round those edges. Sandpaper is great for wood. A file is great for metal when you are holding it with cut-resistant gloves. Protect your hearing. I have heard many people complain about their hearing loss. Power tools are loud. Earplugs are cheap. Be aware of your surroundings. Don't use power tools with children or pets nearby. My great-grandfather was a carpenter and a woodworker most of his life. He managed to avoid losing fingers until, in his 90s, he cut off part of his thumb with a table saw. Injuries can happen to newbies and very experienced woodworkers alike. Woodworking is a rewarding creative outlet. Enjoy it with all of your body parts intact.